Despite the fact that Lenovo hasn't yet embraced the Snapdragon 600 SoC, it looks like the Chinese company's finally giving Qualcomm a proper chance with the latter's more powerful Snapdragon 800. Starting yesterday, several cheeky images of an unannounced dual-SIM Android phone -- codenamed K6 or X910 -- popped up in Lenovo's official Chinese forum. The photo after the break shows AnTuTu indicating the presence of the relatively new MSM8974 chip (with Adreno 330 GPU) plus a 1,920 x 1,080 display (which looks like a 5-inch panel to us); so unless the app made a mistake, what we have here could be Lenovo's upcoming flagship device. While not much else has been said about the phone, one of the leaksters described it as thin and light, and that it felt good in hand. 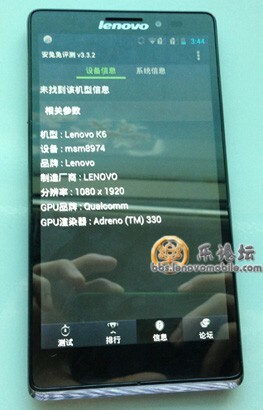 But to be honest, we're not too thrilled with the design ID here, especially with that K860-inspired back. What's interesting, though, is that according to a source of ours, the "X" in X910 may be a wildcard that depends on the kind of deal Lenovo made with Qualcomm. At this point, we've been told to assume it'll eventually become the K910, which would, sadly, make this phone an uglier successor to the Intel-powered K900. Either way, chances are we won't be seeing many of these outside China, anyway.